To first understand the demented nature of UFC 223, it is best to begin at the end and then work back because the event concluded simply enough. 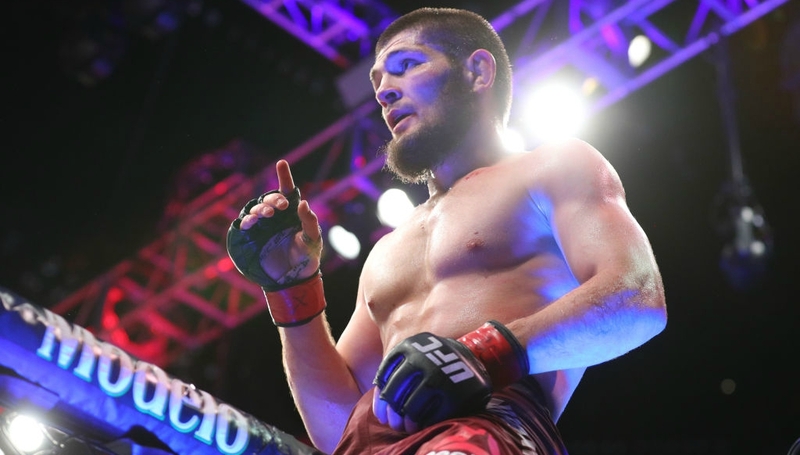 Indeed, as was widely anticipated – although the probability differed for each new opponent – Khabib Nurmagomedov emerged from Brooklyn’s Barclays Center as the undefeated and undisputed (or rather heavily disputed) lightweight champ. 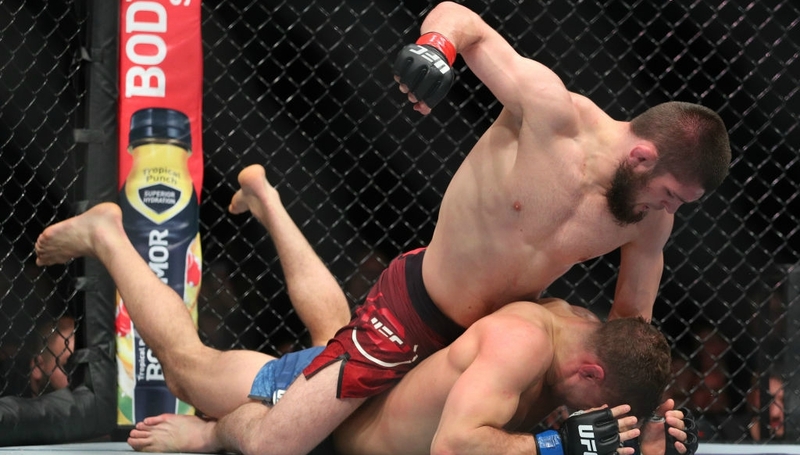 In the most unpredictable week in UFC history – a statement of gravitas given the rollercoaster rides of recent years – Nurmagomedov dominated a game Al Iaquinta over five rounds to claim the belt. But the journey there was far from straightforward. Here’s a synopsis of the last week: Nurmagomedov was initially scheduled to face Tony Ferguson but the fight was scrapped for a fourth time after the interim champ tripped over a cable and tore his ACL. Featherweight king Max Holloway accept a call-up to step into the main event slot on six-days notice but was then declared medically unfit to continue his weight cut by the New York State Athletic Commission. Undercard fighters Anthony Pettis (pay disagreement) and Paul Felder (unranked) were both denied shots at Nurmagomedov before Iaquinta was handed the opportunity 24 hours before fight night. The narrative throughout the week shifted from one to the next but the Dagestan-native deserves tremendous credit for riding through it all. While his performance, particularly in the striking department, cast further uncertainty over his capacity to defeat Ferguson or Conor McGregor, it was a commanding display befitting of any champion. The 29-year-old called for former two-weight belt holder Georges St Pierre next, although, divisive Irishman McGregor lurks in the background. McGregor whipped up chaos after allegedly leading his friends and camp members in an attack on a transport van carrying fighters – including Nurmagomedov – during fight week but is expected to contend for the belt he has just been stripped off. “We have to finish this beef, chicken or something like this,” Nurmagomedov said at the UFC 223 post-fight news conference. “He has to stop eating Burger Kings. You want to fight? Come. I told you guys, I’m going to make him humble. I’m going to change his game. Now only one champion. “No more fake champions, no more champion who never defend his title or something like this. Now UFC has champion, and this champion wants to defend his title. Three fights were dropped from the card as a result of McGregor’s alleged bizarre bus attack but it could have been four had Rose Namajunas decided to withdraw. The strawweight queen was inside the bus at the time of the incident and admitted after defending her title against Joanna Jedrzejczyk that she considered pulling out. “It shook me up just because it was just such a – I didn’t know how far it was going to escalate,” Namajunas said in the post-fight press conference. Thankfully, the 25-year-old remained on the card and retained her title with a technically tight performance, banishing the “fluke” sentiment stemming from her first-round KO of Jedrzejczyk at UFC 217 to secure a unanimous decision win. And so the show moves on but UFC 223 has left an indelible mark for good and for bad. Khabib Nurmagomedov took aim at Conor McGregor after ending a dramatic week on a high by defeating late replacement Al Iaquinta via unanimous decision to succeed the controversial Irishman as the UFC’s new lightweight champion. The unbeaten Nurmagomedov claimed a 50-44, 50-43, 50-43 victory at the UFC 223 main event at the Barclays Center in Brooklyn. The 29-year-old Russian took the title which was stripped from McGregor on Thursday, before the Irishman was charged with assault following a backstage disturbance at the media day ahead of the event. McGregor handed himself in to police after footage emerged online in which he appeared to throw a hand truck at a bus taking rival fighters away from the Barclays Center. McGregor, who last fought when he was beaten by Floyd Mayweather in a boxing bout in August, has not fought in the Octagon since winning his belt in November 2016. UFC president Dana White, who had labelled the McGregor incident “one of the most disgusting things that’s happened in the history of the company”, revealed he had talked with the Irishman. “I think there is mutual respect between us,” said White at a press conference after the event, adding he did not currently have a plan for how to deal with the fighter. “I had so many things thrown at me this week to focus on the show was insane. We’ll get back and we’ll focus on Conor McGregor. “He didn’t come to New York to do anything with me. He jumped on a plane with all those guys to come to New York for the Khabib thing. I didn’t even know Conor was here. While McGregor’s behaviour may have overshadowed Nurmagomedov’s bout, the Russian also had to cope with having to prepare for three separate opponents. He had been due to face Tony Ferguson, who suffered a freak knee injury, while Ferguson’s replacement Max Holloway was deemed not fit to fight. Iaquinta, who weighed in 0.2lbs over the lightweight limit, stepped in at the 11th hour, and showed plenty of heart to last the five rounds, although he could not trouble Nurmagomedov. Cris Cyborg crushed Yana Kunitskaya in the main event of UFC 222 to ensure the women’s featherweight strap remained tightly wrapped around her waist. The 32-year-old decimated the Russian challenger in the first round of their makeshift short-notice bout with any threat of an upset buried by the Brazilian’s booming right hand. But a devastating right is what led to a shock win in the co-main event as Brian Ortega poleaxed Frankie Edgar to put himself in line for a title shot of his own. It is Cyborg, however, who finds herself in unfortunate territory. The Brazilian’s hegemony over the women’s featherweight division means she is fast becoming a fighter who with each dominant victory, loses. Unbeaten and relatively untested in the UFC, Cyborg hasn’t lost since her first pro fight, beating senseless one victim after another. She is one of the best ever to do it, regardless of weight class or gender and yet therein lies the tragic irony to the Cyborg narrative. She is an apex predator in short supply of the sustenance required to translate her undeniable skill and dominance to a widened audience. Her superiority has become boring, the entire notion of competition eroded with each passing contender failing to mount a legitimate challenge. Kunitskaya was the latest example but she won’t be the last. The Russian’s expression when Cyborg’s first right-hand landed was that of a panicked deer. Every strike, she shrunk and this wasn’t a case of an undersized 135-pounder moving up to slaughter. The former Invicta champ was broader, taller and even stronger in some of the grappling exchanges. But she genuinely looked like someone who had never been hit in the face before whenever Cyborg landed. "She called me out, and when you call Cyborg out, you have to handle it." The reality is, the champion’s power is such that the force is like of no other female fighter and while Amanda Nunes is next line, the narrative won’t change. 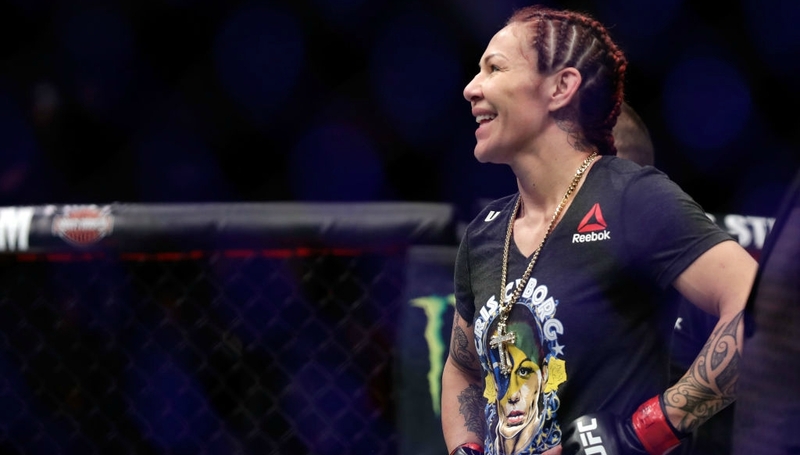 A brave effort will earn the bantamweight queen applause, but for Cyborg it will be another shrug of the shoulders in victory. It’s difficult to know who to pity more the challengers, or the unchallenged. But the contrasting complexion of the men’s 145lbs to the women’s were laid bare by the fight proceeding Cyborg’s main-event mauling. Indeed, Ortega might just be the next featherweight champion and that is not a hot-take solely presented because of the coldest knockout you will see this year. You guys, Brian Ortega's easiest fight in the UFC was Frankie Edgar. The 27-year-old did what no other fighter has managed yet, stop Frankie Edgar, and he did so by virtually decapitating his head with an uppercut of raw violence. Ortega is a nasty submission artist, but his striking is developing at such a rate he has to be considered a legitimate contender to dethrone Max Holloway. Physically, he has the attributes critical in matching the long and rangy Hawaiian with his super-slick composure on the feet or the mat making for a fascinating fight. With Holloway 26 and Ortega 27, the pair represent the fresh-faced new look of the UFC. Conor McGregor’s star-pull won’t last forever, but the promotion is already showing there is plenty of new blood to continue the lineage of talent. The women’s featherweight division is crying out for just that.